I was dropping the kids off at the ferry to New Jersey and I looked up and saw a chunk of the British Isles sticking up over the edge of this concrete thing. Fascinating! You know I've got a thing for a green roof! It really looked like the Highlands or something. So I walked around and saw that there were metal strips wrapped around this big concrete base explaining that this is the Irish Hunger Memorial. One thing New York can thank the Irish Famine for is sending our city a huge percentage of the population of Ireland. The Irish, along with the Italians, the Jews, the Puerto Ricans, the Domincans, etc., etc. all made our city the fabulous wealth of culture that it is today. However, when the potato famine started in Ireland in 1845, one third of the country relied on potatoes as the staple of their diet. Starvation was rampant and the failure of the crop changed everything. Throughout the 1840s, hundreds of thousands of Irish left the country. This structure, part architecture, part art, was created by the Brooklyn artist Brian Toll. When I was there a thin wire fence was wrapped around the base, so no visitors could ascend to what appears to be a ruined castle of some kind. It is a stone structure with access to a mysterious looking interior. I discovered it is a 150 year old cottage imported from County Mayo. 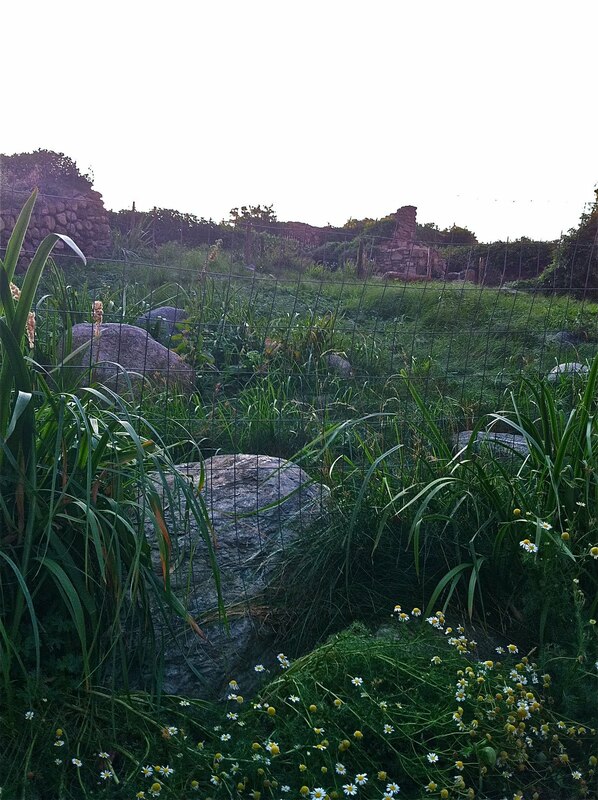 As it happens, this quarter acre of stones and vegetation was imported from County Mayo as well. When you can follow the winding path up through the meadow, you will find yourself on a cantilever looking out at the Statue of Liberty and Ellis Island, two of the most important symbols of freedom and opportunity for immigrants that our country has to offer. I imagine its a very moving experience. The text on the two miles of bands circling the base of the structure includes quotations from politicians, autobiographies, oral histories, letters. It all relates to famine and can be updated at any time. This is an easily and emotionally accessible memorial. The children will respond to the text and the experience. Mine were very disappointed they couldn't climb up and into the meadow. But the words were compelling and the story of the famine is something that we might forget to really emphasize the impact of, without things like this memorial to remind us. Every part of the design is significant and related to the story of the famine and the experience of those who endured it.